Orbis Romani, pars occidentalis. Auspiciis Serenissimi Principis Ludovici Philippi, Aurelianorum Ducis publici juris facta. Auctor d'Anville, Regiae Humaniorium Litterarum Academiae, et Scientiarum Petropolitanae Socius, Celsitudinique Serenissimae a Secretis. MDCCLXIII. This is the stunning western sheet from Jean Baptiste Bourguignon D'Anville's two map set depicting the Roman Empire. Depicts the western portion of the Roman Empire from Italy and Dalmatia westward to include all of Spain, Ireland and England. Also includes parts of North Africa including Carthage. Extend northwards to the Baltic Sea. Uses archaic place names throughout. Decorative title cartouche at the upper right quadrant. 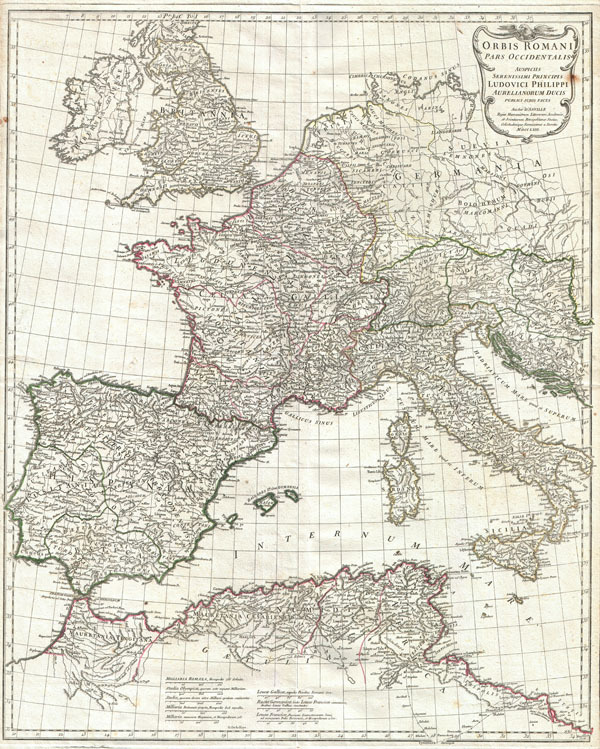 Engraved by Guillaume Delahaye for publication in the 1763 edition of Anville's Atlas General. D'Anville, J.B.B., Atlas Generale (1763 edition). Rumsey 2603.039. Phillips 571, 572, 599. National Maritime Museum, 200.